Microsoft has announced a new series of improvements for the Your Phone app on Windows 10, as the company continues the work on bringing PCs and mobile devices closer together. Your Phone is Microsoft’s latest effort in this regard, allowing users to sync Windows 10 computers and Android phones. Using this app, you can access your photo gallery, read and send text messages, and receive mobile notification right on your desktop. 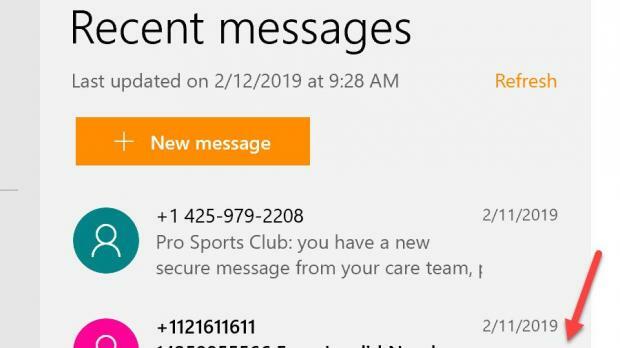 Last week, Roberto Bojorquez, Lead Program Manager at Microsoft, announced a new test for insiders that included a new First Run Experience, as well as hyperlink support within Messages. In other words, Your Phone should now be easy to discover and configure when launching it for the first time, while links in your phone messages are now clearly marked as a hyperlink, which means you can open them on the Windows 10 device with just a click.No ETA for production devicesThis week, Bojorquez introducedother improvements, including bolded fonts for message headers and phone numbers, as well as an unread count for text messages. The Microsoft engineer also revealed the company is working on new icons for the Your Phone app, and they should be rolling out to insiders in the near future. At this point, all the improvements mentioned here are only available for 50 percent of the insiders, and Microsoft is clearly embracing a cautious approach for the time being. Most likely, if no major bug is discovered, all insiders would be allowed to try them out in the coming weeks. There are no details as to when the Your Phone update could go live for production devices, but I’m guessing the upcoming release of Windows 10 April 2019 Update (version 1903) could be a potential target. This OS feature update is projected to be finalized in March and released to users in April.